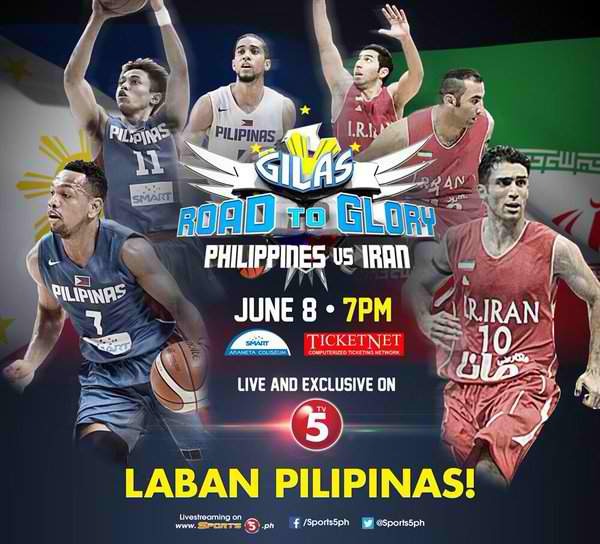 Tune-up Game: Gilas Pilipinas vs. Iran Full Video - Balita Boss! Gilas Pilipinas, the Philippines men's national basketball team, played Iran in a tune-up game as part of their preparation for the Fiba Olympic Qualifying Tournament. This is the second of two tune-up games with Asian rival. Tickets are available at Ticketnet Outlets or online at http://www.etix.com/ticket/p/4283000/gilas-road-to-glory-quezon-city-smart-araneta-coliseum. The first matchup, which is not open to the public, is a scrimmage game, played on June 7 at Gatorade Hoops Center in Mandaluyong. According to the report of Spin.ph, the scores were reset every quarter. Gilas split the four quarters, taking and dominating the first and third quarters, 21-13 and 17-16, respectively, while the Iranians took the second and fourth periods, 16-15 and 19-18. If the scores were added up, Gilas would've won, 71-64. Continue reading the full story on Spin.ph - Gilas 4.0 shows glimpse of potential in first tune-up game of year against Iran.